Contents 8 Newsmakers » 10 Summer from hell » Huge floods, a major cyclone and a devastating bushfire stretch the insurance industry to the limit and bring into focus a gap in its coverage. lawNEWS 60 What you can expect from your BI policy » Two business interruption experts look at the recent floods and analyse the claims possibilities. 62 Knowing and understanding » How flood victims could mount a case for payment, and why insurers need to be clear. Is it really just a case of knowing where to look? 28 Time to consider alternatives? » Flood insurance is only one of several ways to transfer the risk. Ebix works on new systems and keeps Sunrise shining brightest. 32 10 years after HIH » It took 30 years to build and three years to destroy. Ben Oliver traces the steady rise and spectacular fall of HIH. 46 The D&O pressure cooker » Increases in regulator lawsuits and class actions show why directors and officers need cover. Underwriting agencies say they’re doing their bit for the industry. Technology is driving the industry’s new competitive battleground – but it’s really all about the experience. 56 Farewell to the fax » From here on the restoration process will be all about systems, not people. 58 The perfect claim » Like the perfect storm it’s a confluence of many factors. Broker cluster Insight has announced two awards – one that will commemorate the memory of early supporter Peter Michell (above) and another to recognise the contribution of foundation member and former chairman Les McInerny. Executive Officer Bill Friend says former National Insurance Brokers Association (NIBA) Operations Manager Michell, who died in 2005, was instrumental in helping get the former Regional Insurance Brokers Association started. New Zealand’s troubled – and troublesome – Accident Compensation Corporation (ACC) has moved closer to being privatised with a key Government steering group recommending private insurers should be allowed to offer accident compensation insurance. The ACC privatisation issue has been a political touchpoint in the past, and Prime Minister John Key is taking a cautious and gradual approach. But with ACC Minister Nick Smith saying the corporation is ”haemorrhaging $NZ7.2 billion ($5.4 billion) in losses,” the pace of privatisation will speed up after the national election on November 26. The steering group which includes politicians and independent experts says the introduction of private insurers into the accident compensation market is the best way of “transferring the burden of risk-bearing for unforeseen contingencies and unfunded liabilities arising in the future from current levy-payers and the Crown to shareholders of the private insurance companies”. The ACC reported a $NZ10.3 billion ($7.8 billion) loss at June 30 last year. “Employers will be able to choose their workplace insurer, but ACC will still be a provider,” Smith says. Benevolent 2010: Both general and life insurers had plenty of reason to smile at the end of the year, with both sectors recording improved results during 2009/10. The annual Australian Prudential Regulation Authority (APRA) December reviews of the two industries’ performance in the previous financial year shows the life insurers outperforming their general insurance counterparts when pulling the money in – but making much less on the bottom line. APRA says new life premiums for the 12 months to June 30 last year were $40.1 billion, up from $38.7 billion in the 2009 financial year. Net policy payments were $36.9 billion in 2010, up from $35.4 billion in 2009. And net profits for the life industry were $2.7 billion for the year – up from $1.9 billion in 2009. The general insurance industry reported a $4.4 billion net profit in 2010 – nearly doubling the previous year’s net profit of $2.5 billion. The general insurers’ gross premium revenue for the 12 months to June 30 2010 was $32.7 billion, up from $31 billion in the 2009 financial year. The improved profit position was despite a rise in total expenses for life insurers, up from $21 billion in 2009 to $25.1 billion in the last financial year. Most general insurance business segments reported premium growth in the year to June 30 2010, while public and product liability dropped from $2.1 billion in 2009 to $2 billion. NIBA CEO quits: The National Insurance Brokers Association (NIBA) is searching for a new chief executive following the resignation in late January of Noel Pettersen. After 20 years running NIBA, Pettersen has given six months’ notice of his intention to retire. New NIBA President David Duffield says the search process will follow a board review. New life for West Duncan West quit his Melbourne-based job as chief executive of CGU late last year [see last issue], but he wasn’t unemployed for long. National Australia Bank has hired him to head up its life insurance operations in MLC and NAB Wealth. UK-born West has had a brilliant career in Australia’s general insurance industry. He was the founding chief executive of Vero before the ProminaSuncorp merger saw him temporarily grounded. Richter scale struck Christchurch on January 19, with aftershocks registering 3.2, 3.4, 4 and 3.2. While less severe than the 7.1 magnitude earthquake recorded in September, the latest bout of tremors shook a city still rebuilding from the nation’s costliest natural disaster. New Zealand Insurance Council Chief Executive Chris Ryan says premium rises are likely in the wake of the earthquake. “The size of increases is very hard to predict as there are forces driving premiums down as well as up,” he said. Group Chief Executive Frank O’Halloran has started 2011 at a cracking pace, with a couple of big moves keeping analysts away from the beach. The global Australian insurer made a foray into the financial institutions sector with the purchase of the local operations of US-based Cuna Mutual. After that came news of the big one: a 10-year distribution deal for the Bank of America’s Balboa Insurance business. Balboa’s 2009 accounts show gross written premium of $US1.9 billion, which after liabilities gave an after-tax profit of $US443 million. QBE estimates future gross earned annual premium will be about $US1.3 billon, while net earned premium will be $US1.5 billion. Under the deal QBE will make a $US700 million upfront payment to Bank of America for the distribution rights. “However, the large part of the $1.5 billion now estimated to be paid to New Zealand comes from international companies, and over the next few years there is likely to be some cost to all insured parties as a consequence." The receiver of the Pike River Coal mine on New Zealand’s west coast has taken over the management of the mine, where 29 men died in a series of gas explosions in November. Now the best asset of the mine – which previously exported high-quality coking coal to global markets – is its insurance policy, according to PricewaterhouseCoopers receiver John Fisk. He says it could take six months or more to sort out the business interruption claim for the underground mine, but has warned that a final settlement with insurers will probably be “considerably less” than its $NZ100 million limit. Baptism of floodwater: Most industry leaders get a chance to adjust to new realities when they take up the presidency of the Insurance Council of Australia. Not so new president Rob Scott, however. He assumed the presidency from Allianz Managing Director Terry Towell at the end of the year and almost immediately found himself thrust into the hurly-burly of media and political affairs following the devastating Queensland floods. Mr Scott is the Chief Executive of Wesfarmers Insurance. “Hashtag”, “twaffic”, “retweet” and “twitsphere” are just some of the terms that insurers – known for their love of jargon – must embrace to keep up with social media, according to the latest JP Morgan Deloitte survey. It says integrating social media presents risks and challenges, but to do nothing could be worse. About 20% of all sales are predicted to go through the internet by 2015, and with 75% of online Australians using social networking site Facebook, the onus is on insurers to develop “appropriate social media policies and guidelines”. “In our view, insurers would be wise to be at the table now, rather than try to catch up later with competitors who have a head-start in embedding social media into their respective business models,” the report says. Besides a lack of social tech savvy, the insurance industry is otherwise doing well despite the impact of catastrophic events, an easing in reserve releases and a two-speed premium market. The survey says the combined ratio for insurers in 2010 improved by four percentage points to 97%, thanks to average personal lines premium rises of 8%. A different story has been told in commercial lines, where premiums fell by an average 1%. “It was a year of two markets,” JP Morgan senior insurance research analyst Siddharth Parameswaran said. “The biggest reductions were seen at the top end of the market, while small to medium-sized enterprises were relatively flat.” Brokers again cited staff recruitment and retention as their number one concern, while reinsurers continued to confront natural catastrophe event losses. More than 40% of insurers also now cite distribution trends as a key threat. In the language of the twitterati, these issues would be hash tagged as #staffhire, #catlosses and #badchannels. ABOUT THIS EDITION: In this edition we’ve tried to ignore the disaster headlines and get into the issues thrown up by floods, cyclones and bushfire. Are there better ways for a country like Australia to deal with catastrophes that destroy not only homes and businesses, but also massive amounts of infrastructure? What do insurers need to do to understand the risks better – and how much information is sufficient? We’ve tracked the summer of disasters chronologically to show just how mixed and widespread these events were. Our law section (page 6063) contains some useful advice on legal aspects of the flood claims issue. affected by the blizzard, which closed airports, cut rail links and caused massive power cuts. The February storm is estimated to have cost insurers between $US790 million and $US1.4 billion. On the other side of the US, Los Angeles experienced the equivalent of six months of rain in three weeks in late December, causing some of the worst flooding in California’s history. The only positive note from the wild weather was the experience of a depressed New Yorker who jumped from a ninth-storey window, only to be saved by a huge pile of garbage hidden under the snow. It had been too cold for sanitation workers to collect it. 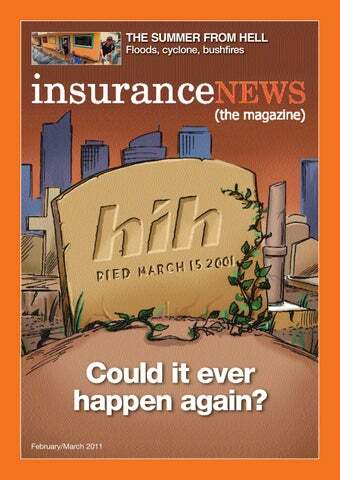 We couldn’t let March go by without a reminder that it’s 10 years since HIH fell over. The HIH disaster also changed governments’ understanding of insurance, teaching politicians of all stripes that a strong and secure national economy isn’t possible without a strong and secure insurance industry. It’s a very well known story in the industry, for good reasons. But for anyone who has joined in the past six or seven years, the story of HIH and the aftermath of its collapse is a little piece of history worth knowing and understanding. For everyone else it’s a story that shouldn’t be forgotten. In this issue we trace the short and dramatic story of HIH and revisit some of the major players who were thrust into the spotlights. Our question to them is, could it happen again? Material in insuranceNEWS (the magazine) is protected under the Commonwealth Copyright Act 1968. No material may be reproduced in part or in whole without the consent of the copyright holders. The content of articles appearing in this magazine do not necessarily reflect the views of the Publisher. All statements made are based on information that is believed to be reliable and accurate, but no liability is accepted for any fault or omission. We also accept no responsibility or liability for any matter published in this magazine that reflects personal opinion. Printed on FSC paper stock using vegetable based inks by a printer with ISO14001 Environmental Management System Certification. accurate flood mapping in Australia. It’s a viewpoint which has attracted many critics and raised questions about why Suncorp can do it – and get reinsurance support – while the others can’t. Now the industry wants the Federal Government to foot the estimated $50 million bill to terrain-map all of Australia, so they can accurately assess the flood risk. It’s an interesting negotiating point, and raises the additional question: why are they asking now? Most people in rural areas have become accustomed to the concept of occasional flooding, and appear to understand that insurance cover against an inevitability isn’t feasible. City folk are different, and they react badly and in numbers to such setbacks. Over the past couple of months insurers with long enough memories have had cause to recall the Wollongong floods of 1999, in which they were castigated for many months by angry claimants, local media and politicians. After Wollongong, most insurers held firm and refused to pay claims for losses that were obviously caused by floodwaters. Eventually people moved on and the issue died away. Not this time. Minister Shorten is a man on a mission, and this time he’s prepared to use legislation and regulation to force a solution on the industry. Whether or not flood victims succeed in getting their claims paid, the period from December to March will cost insurers and reinsurers billions of dollars. It will place considerable strain on industry professionals and thousands of people are going to be blessing the day they paid up for proper levels of cover. But for flood victims, recovery from their loss is likely to be long and bitter. It was the wettest December on record for the eastern states. What bought about the change in the weather was a strong La pattern in the Pacific Ocean. The December Southern Oscillation Index was +27.1 – the highest December value on record. Other features of this La Nina indicated the strongest event since at least the mid-1970s, and one of the four strongest in the past 100 years. Previous strong La Nina patterns occurred in 1973/4 and 1955, and both were associated with widespread flooding in the eastern states. The first six major rain events occurred in eastern Australia between the beginning of December and mid-January. Central Queensland floods (November 28 – December 4) A pressure trough stationary over eastern Australia delivered 100-300mm of rain on central Queensland, extending from Mackay to Emerald. Many houses were flooded and roads cut including the Cunningham Highway. The rail line out of Townsville was damaged. An 81-year motorist was also swept to his death on a flooded road in central Queensland. Rockhampton is no stranger to flood, says local broker Peter Peirano. He says the cattle and mining centre has seen it all before, so it was hardly surprising when the Fitzroy River started to break its banks and slowly flow into the town. Mr Peirano, the Principal of Piranha Insurance Brokers, says many residents saw it as “a here we go again moment”. those insurers who “sat on the fence” waiting for hydrologists’ reports before deciding on claims. “It’s just wrong – so wrong,” he says. He says the industry must work towards introducing a standard flood definition, reassessing embargo procedures and working out how to price flood risks. “Other than that, as a community team-bonding experience it has been magnificent,” Mr Peirano says. “Every crisis brings out the best in people.” Regional Insurance Brokers Director Darren Green wasn’t surprised by the floods in his hometown of Rockhampton, but it was a different story in the nearby town of Emerald. He says Emerald copped a bad flood in 2008, but this one was far worse. But he says everyone in town is “jumping in to help clean up the damage and trying to get back to business as usual”. He says the biggest hurdle commercial businesses face is not knowing what the insurance companies might do on meeting claims. “No one knows where the insurers stand now,” he says. But overall he says people are “handling the situation fairly well” and concentrating on recovery. Central Queensland floods (December 19 – 20) A trough across Queensland was linked to a deep low off Tasmania which produced a further 100mm of rainfall in central Queensland. Some towns were flooded again – the third time in as many weeks – and many roads were closed. Toowoomba and Lockyer Valley flash floods (January 11) An upper level low combined with a humid easterly airflow resulted in very heavy rainfalls in southeast Queensland and northeast NSW. The area bounded by Brisbane, Gympie and Toowoomba saw threeday rain totals exceeding 200mm, with some exceptional localised falls of up to 648mm. More than 160mm of rain fell on Toowoomba, which sits in a shallow “dish” of about 40 square kilometres. Creeks converge at the northern end of the city centre before heading out onto the Darling Downs. Residents reported an hour of particularly intense rain shortly before the city was hit by a flash flood that tore through its centre, causing a number of deaths, then heading west to the Lockyer Valley. One of the most fertile and intensively cultivated areas in Australia, the valley was no match for the wall of water which rapidly pushed its main creek to a record height of 18.92 metres, exceeding the previous record set in 1893. The flood was described as an “inland tsunami” with towns such as Grantham devastated. Almost every home and business in the valley suffered some damage, with a number of houses being declared write-offs. The death toll from the flash flooding reached 35. One of her clients, a car dealership, had more then 100 volunteers pitch in to help clean up. “It was just amazing.” Jardine Lloyd Thompson Australia’s Senior State Executive in Queensland, Russell Ditchburn, was monitoring the weather situation from his Brisbane office. His summation: pretty scary. “When it became pretty obvious the rain wasn’t stopping we made a quick decision to send staff home,” he says. “By lunchtime both our Brisbane offices were evacuated.” Having gone through the 1974 Brisbane floods as a teenager, he had a fair idea of what to expect this time. “I had a lot of recollection of the areas affected, and I just hoped it wouldn’t be as bad.” He says JLTA managed through the flood crisis “reasonably well” because managers were able to remain operational with a lot of remote access – one of the benefits of modern technology. For the most part clients showed great resilience, “and it was good to see a lot of the insurance companies looking to pay as quickly as they could”. He says the road back for Queensland will be a long one, “but it has been fantastic to see everyone roll up their sleeves and get to work”. There’s a really distinctive smell about a suburb that has had a bushfire go through it, says a claims assessor working in the southeastern suburbs of Perth. “It gets you after a while. It’s not just the trees, it’s the smell of burned houses.” The assessor, who declined to be named, says most people whose homes were destroyed in the February fires have come to terms with their loss. Perth bushfires (February 7) An ongoing drought and blustery weather combined to create ideal conditions for a bushfire to run out of control near Perth. On February 6, a high pressure system off the West Australian coast combined with a low to the north of Perth to create wind gusts of up to 70kmh in the Champion Lakes area southeast of the city. The following day the weather patterns remained similar, but with a pressure trough extending from north of Exmouth to south of Perth creating even stronger winds, with gusts of 72kmh. While a fire ban was in place, an off-duty policeman in the southeastern suburb of Roleystone allegedly operated an angle grinder, the sparks from which started a grassfire. Fanned by the high winds, fires swept through areas of Roleystone and Kelmscott, destroying 72 homes and damaging 32. The high-pressure system in the Great Australian Bight was pushing winds from the east and as it moved away the next day sent winds east southeast with gusts of up to 37kmh. The winds did pick up later, gusting to 81kmh, but by then the fires had been brought under control. An estimate of the insured losses from the fires was not available when this edition went to press. rivers, storm tides and overland flows for a defined flood event. “The maps build on existing knowledge and information and use computer-generated mapping to show areas that may flood in a period of intense rainfall or extreme storm events,” the spokesman says. “For property-specific information, the free floodwise property report provides details on anticipated flood risks for a specified lot or property.” But flood maps can become inaccurate if the database is not kept up to date. Changes such as new roads, developments and natural earth movement could alter the paths of floods. Brisbane City Council does review its floodwise property report database when there are significant changes in ground level, new survey data, new developments or new rainfall information. Insurers such as Suncorp do use these maps to help price flooding risk, but they are one of the few insurers offering flood insurance in Australia. The Insurance Council of Australia (ICA) has been working on a national database based on information from local authorities and water catchment bodies. But ICA seems to have conflicting views as to what information is available, and has now called on the Federal Government to fund a $50 million national mapping program. Chief Executive Rob Whelan says ICA’s National Flood Information Database (NFID) does not cover every flood-prone region in Australia, claiming some local authorities and water catchment bodies haven’t released their data. “In Queensland more than 90% of catchment flood-mapping data is still to be sourced for the NFID,” he said. However, ICA’s Current Issues Brief on flood insurance says many rural areas do have flood maps, and “approximately 80% of all flood loss occurs within these areas”. But if a homeowner obtains a flood map from a local authority, can it be used against an insurer to settle a claim legally? According to the City of Brisbane, its flood-mapping services are for reference only and should not be used in place of advice from a registered engineer. Immediately after the Brisbane flood, Perth-based aerial photography specialist NearMap was asked by the Brisbane City Council to provide comprehensive coverage of the Brisbane flood. NearMap says it has noted a “huge increase” in requests for material from insurers since the floods began. So does the insurance industry actually need a new flood-mapping database? It would seem there is a lot of accurate information available, although there are some noticeable gaps – such as Sydney. It is also possible some information is buried in municipal engineers’ offices, waiting for somebody to ask to look at * them. partnership – under which a state could purchase insurance cover which is triggered by the physical characteristics of a catastrophe, such as a windspeed, rather than pure damage. The reinsurer would pay out any time a cyclone of agreed windspeed passed through a defined geographic area. Mr Senkevics says payments can be used for a variety of purposes, including funding emergency response, replacing lost tax revenues, rebuilding infrastructure or funding future increases in insurance expenses. Catastrophe bonds, better known as cat bonds, transfer the risk of natural disasters to investors, who receive a yield in return for agreeing to cover future damage. There are other options to examine, of course. The United States Government’s National Flood Insurance Program offers cover to homeowners, renters and business owners if their community participates in flood mitigation schemes. France moved into the flood insurance market following devastating floods in 1982. Under its natural disaster compensation system, people who have car, home or business insurance that covers fire, water damage and theft are automatically covered for damage from flood, landslide, drought, avalanche or earthquakes. Germany uses a similar scheme which offers flood cover as a supplement to building or contents cover. New Zealand’s Earthquake Commission was established in 1945 to provide earthquake and war damage cover for those with fire insurance, but later expanded to cover other natural disasters. Like most successful government-managed schemes, it is available only to those who already have private sector insurance. The United Kingdom currently has a system in place which provides government financing for flood mitigation, in return for private sector insurers providing near-universal cover. However, the cash-strapped UK Government has decided to hold back more than £200 million ($321.3 million) in flood defence funding. Under a 2008 deal with the Association of British Insurers (ABI), the Government agreed to maintain flood defences until the end of 2013 in exchange for ensuring cover would remain widely available. London-based JLT Partner for European Real Estate Bill Gloyn told Insurance News the insurers are currently considering their position, but a 17% reduction of expenditure on flood defences “hasn’t won a lot of positive comment”. He says a reinsurance pool is one last option that could work to solve the problems associated with flood cover in the UK. A prescient presentation in November by Chris Latham, Peter McCourt and Chris Larkin of PricewaterhouseCoopers at an Institute of Actuaries seminar asserted that the current arrangements for natural disasters actually create uncertainty. They said the Federal Govern-ment is already a large funder of costs and that a formal scheme such as a reinsurance pool or natural disaster insurance scheme would recognise the reality, remove the uncertainty and enable better funding. Marsh’s John Clayton says complacency may have set in following Cyclone Tracy, but that doesn’t make it right. He says at the time many believed it wouldn’t happen again – “but now it has, and these kinds of events are on the rise”. “It would be pretty poor if we didn’t find some kind of appropriate solution to this.” The Federal Treasury has declined to speculate on the possibility of a reinsurance pool, saying it’s concentrating on the Government’s package of spending cuts and a flood levy to support the recovery process. The issue may get a hearing at the impending commission of inquiry ordered by the Queensland Government. But with insurers cool at best to the concept of a reinsurance pool and the Federal Government intent on making it more difficult for the insurers to avoid providing flood insurance, there is a risk that more sophisticated risk transfer so* lutions will be ignored. From start to finish, a tragic story of conflict, hubris and mismanagement RAY WILLIAMS WAS AN INSURANCE MAN WITH SOME BIG ideas. In 1964 he met London underwriter Michael Payne and the two hit it off immediately. Four years later, they launched what would years later become HIH Insurance – MW Payne Liability Agencies. Williams was named chief executive and director, with Payne a director. Starting in Victoria, Williams quickly expanded the business into Tasmania and later South Australia. George Sturesteps and Terry Cassidy joined the company in the early 1970s, and both went on to become executive directors. Cassidy would later be jailed for 10 months after HIH collapsed for making false statements to the Australian Prudential Regulation Authority (APRA) and failing to discharge his duties as a director. In 1971, MW Payne Underwriting Agency was acquired by UK group CE Heath and changed its name to CE Heath Underwriting Agencies. Williams was retained as chief executive. CE Heath was original a workers’ compensation underwriter, but legislative changes forced Williams to diversify into other classes – and markets. In 1987, the company established a workers’ compensation underwriting operation in California, the first in a series of aggressive overseas expansions to follow. CE Heath floated on the Australian Stock Exchange (ASX) in 1992, but it wasn’t a complete success. Before the float proceeded, Cassidy, Sturesteps and Williams had agreed to purchase additional shares. Williams even had to borrow $10 million to meet his commitments as a sub-underwriter. intentionally dishonest and failing to discharge his duties as a director in good faith and in the best interests of the company. The charges revolved around an Adlercontrolled company, Pacific Eagle Equities, which purchased more than 13.7 million HIH shares on June 15-19 2000 using $10 million provided by HIH. Adler then told a finance journalist he had purchased the shares for himself because he believed the HIH share price was undervalued. In October 2000 Adler sought a $2 million investment from HIH in Business Thinking Systems, another company in which he had an interest. Ray Williams gave evidence that Adler told him he had raised $2.5 million and was prepared to invest $500,000 of his own if HIH would invest $2 million. He had not raised the money and had no intention of investing his own, either. Adler then told an HIH executive he had invested the $500,000. The HIH board discussed and approved the $2 million investment in November 2000. Adler attended the meeting and did not disclose his financial interest in the business or his knowledge of its financial affairs. Adler’s appeal against the severity of his sentence was dismissed and he was released from jail on October 13 2007 after serving two-and-a-half years. Last year he was reported to be providing consulting services on ethical business practices. A personable man who built an empire from a small start in workers’ compensation, ironwilled businessman and philanthropist Ray Williams was sentenced in April 2005 to a maximum term of four years and six months. Having been sued by ASIC, fined $250,000 and ordered to pay $2.6 million compensation, he was also banned from being a director for 10 years. In the criminal case he pleaded guilty to three charges: The first – authorising the issue of a false prospectus in October 1998 – revolved around a converting notes issue to be co-underwritten by Societe Generale Australia Ltd (SGA), which would also take up an allocation worth $35 million. What the prospectus didn’t say was that HIH would pay SGA $35 million in a “total return swap”. The second accused Williams of making misleading statements in HIH’s 1998/99 annual report by overstating the operating profit of $102 million by $94.4 million. HIH had entered an arrangement with Hannover Re, which purported to be two contracts of “traditional reinsurance” but were in fact useless “financial reinsurance” contracts which boosted the reported operating profit. The third charge said Williams was reckless and failed to discharge his duties for a proper purpose. This related to an October 2000 letter sent to noteholders in subsidiary company FAI Insurances stating that FAI was being managed to meet its obligations. In fact, among other things group shareholders’ funds for FAI and its subsidiaries had fallen below the minimum requirement of $200 million. Williams served two years and nine months of his sentence. News Ltd newspapers reported Williams, who was declared bankrupt, had reportedly transferred property now around $21 million to his wife’s account before his conviction. rate – yet the acquisitions kept on coming. Despite the UK branch making a core earnings loss of £1.2 million for the three months to March 31, in April, HIH Winterthur acquired the Cotesworth Group, a managing agency of four Lloyd’s syndicates. Winterthur board to keep its shareholding – a meeting conducted almost entirely in German – had failed, as had any attempts to find anyone willing to pick up Winterthur’s 51%. Fortis and Liberty Mutual were both reportedly interested in acquiring the shareholding but backed away due to a lack of due diligence and board control. An audit of the UK operations in 1998 also found the marine operation had been technically insolvent since December 1997. It was under these circumstances the perceived opportunities from the FAI acquisition may have been a pleasant distraction from HIH’s problems. After receiving Adler’s courier, Williams ordered chief financial officer Dominic Fodera to examine FAI’s results. His assessment was hardly glowing and cast serious doubts on its finances, suggesting FAI’s share price was over-rated. Williams was unmoved. He met with Adler once more, this time asking for due diligence on FAI’s books. He also asked for access to Andersen Consulting’s 1998 audit papers. Adler blocked both requests. Still Williams went ahead. The September 22, 1998 meeting of the HIH board, called to vote on a takeover of FAI, was shambolic. Nearly half the board members were absent overseas and were given no notice. Two of the directors attended via video conference, and only three were been given copies of relevant documentation. Williams estimated the synergy benefits from the takeover were nearly $60 million, based purely on his “gut feel”. The board – such as it was – voted unanimously to approve the takeover. a financial advantage. The 13 charges related to $124,000 he paid in bribes to HIH General Manager Finance Bill Howard to push through false claims totalling $4.9 million, plus the forgiveness of a debt owed to HIH of $1.79 million. The last payment was made on the day HIH crashed. In December 2003 Howard was sentenced to three years’ jail, with the sentence fully suspended on the basis of his assistance to the HIH investigation. Cooper was released from jail last October after serving his five-year minimum sentence. Throughout 1998, FAI negotiated new reinsurance arrangements that gave the appearance of a risk transfer. There was none. “These and other arrangements allowed FAI’s under-reserving problems to be concealed,” the royal commission found. One of the more poisonous elements in the FAI takeover was the acquisition in 1990 of Home Security International (HSI), the security group started by entrepreneur Brad Cooper. He and Adler had become friends. Williams had no interest in a home security business, but conceded it would take time to sell HSI. He was particularly concerned about $113 million owed to HIH by HSI and FAI Finance Corporation (FFC), including $28 million in HSI equity. HSI had been steadily losing money for years, and Williams feared the market impact of an FAI-branded company falling over. Adler requested regular payments to keep HSI afloat, which Williams approved, and HSI was never extracted from HIH. Cooper later joined a flood of investors, HIH staff and consultants riding the “rivers of cash” in the insurer’s final months. Under-reserving problems at FAI were quickly discovered by HIH post-acquisition, although the full scale of the deceit wasn’t uncovered until much later. By December 1998, FAI had a case reserve shortfall of $84.2 million and Adler responded defensively when confronted by Williams, arguing reserve problems “could happen to anyone”. As HIH grappled with the scale of FAI’s reserve shortfall, the deterioration of HIH America’s financial position was accelerating. Internal audits in October 1998 and February 1999 showed the company was in a dire state. In mid-April, AM Best downgraded HIH America’s rating to B++. Yet many members of the HIH board remained unaware to the extent of HIH America’s precarious position; in June 1999, an internal audit on HIH America was removed from the board’s agenda. Williams told the royal commission he removed the report because he was concerned policyholders in the US might hear about it, therefore jeopardising future legal proceedings challenging policy claims. Justice Owen described the argument as “illogical”. HIH’s UK results were equally alarming. In the first three months of the year, the UK operations lost £10.8 million on gross written premium of £76.8 million. Yet from all outward appearances the division appeared healthy. HIH’s half-year results to June 1999 booked a pre-tax profit of $52 million, including $92.4 million on reinsurance arrangements. But the corporation’s profits were a house of straw. Its reinsurance arrangements were a sham and intangibles had now increased to an incredible 60% of total shareholder equity. It was at this point, an APRA officer would later testify, that regulatory intervention would have been required to save the company. But it wasn’t until late 1999 that warning bells at APRA began to sound. And when they did the regulator was slow to react. Much blame has been attributed to APRA for fiddling with internal politics and procedures while the HIH empire burned. By late 1999 APRA was aware HIH was spending an unusual amount of money on its reinsurance program, and in early 2000 APRA began suspecting HIH was using reinsurance for “profit-smoothing”. The regulator missed key signs of the company’s poor state and failed to act swiftly once those signs were discovered, but in attempting to unravel HIH’s tangled finances, APRA was hamstrung on two counts. Created in July 1998, APRA was still grappling with its new role and was very much an organisation finding its feet. The relocation from Canberra to Sydney had also had a destabilising effect. But APRA had a much larger problem; it was being actively misled by HIH. In March 2000, APRA finally met Williams and Fodera to discuss the company’s problems. The regulator’s officers were told HIH was “optimistic” about its UK operations and an upturn in the market was imminent. What Fodera and Williams didn’t say was the UK assets were in terminal decline and a decision to place the business in run-off had already been made. Two months later APRA wrote to Williams requesting an on-site review. By this point concerns about HIH’s fiscal position were becoming more public. The company’s shareholder equity was now 75% intangibles, and media reports were questioning HIH’s viability. The company had already recorded $530 million in inter-related losses and now its banker, Westpac – with $320 million exposed to HIH – sought assurances at a meeting with Williams and Fodera in June. In the same month APRA received a report from an anonymous former HIH employee which exposed its precarious capital adequacy. APRA visited HIH in August, noting numerous problems with the company’s risk management processes. In a letter to Williams, the regulator noted HIH’s investment strategy was “based on the premise that the group’s business risk arising from underwriting performance and its reinsurance policies should not be compounded by the investment risk”. TERRY CASSIDY Managing Director, HIH Sentenced in April 2005 to 15 months’ jail – released after 10 months. Sentenced in December 2006 to 12 months’ periodic detention. ROBERT KELLY Assistant Company Secretary, HIH Sentenced in November 2006 to 500 hours of community service. FREDERICK LO Company Secretary, HIH Sentenced in February 2007 to nine months’ jail. ASIC also accepted an enforceable undertaking from General Re Australia, which provided for the payment of $27.2 million to the HIH liquidator. dipped their noses in the corporate trough during a shameless cash grab in the final months of HIH – a period that came to be known as the “rivers of money”. Among the most offensive of payments was more than $13 million paid to Brad Cooper for services rendered to HIH – services from which Justice Owen would later say were “difficult to see what, if any, benefit HIH obtained”. Cooper paid HIH Finance General Manager Bill Howard $124,000 in bribes to grease the wheels. At least 10 payments were made to Cooper, often on the same day an invoice was received. In February, the board approved a retrospective increase in directors’ fees. Bonuses were given to several HIH senior managers immediately prior to the company going into administration. Even HIH’s legal counsel got in on the act. Knowing full well HIH’s reserves were exhausted, the firm requested $1 million in outstanding fees. Payment was made the same day; the law firm wasn’t even required to provide an invoice. On February 22, HIH was suspended from trading. The company announced it would not release its interim financial results until March 16 and a belated APRA investigation finally commenced on February 26. Three days later, APRA served notice on HIH to show cause why an inspector should not be appointed. HIH launched a series of frantic, 11th-hour moves to keep the company afloat, including a sale of its share of the Allianz joint venture back to Allianz, all of which ultimately failed. Ernst & Young told the HIH board that regardless of the release of funds from reinsurance contracts, the company faced a cash crisis. By March 14 it was all over. KPMG told HIH it was “at best marginally solvent” and that it would recommend to the board the company be placed into administration. On March 15, HIH went into voluntary administra* tion. Mr Skehan says directors are also being left out of pocket with investigation costs, which are largely a by-product of ASIC “upping the ante” on enforcement actions. He told Insurance News if a company’s cover has investigation costs included in a $30 million policy, then services like investigation can be allinclusive. But if the policy has a sub-limit, it is invariably only covered for about $250,000 for these costs. “The regulator’s more active investigative role has meant that limits for representation costs are being eroded at a very early stage, so there’s often very little left in reserve for when proceedings develop into serious litigation,” Mr Skehan says. “And if you have eight or nine directors involved, it’s not going to go very far.” Ms Elias says further pressure is being applied by the number of enquiries the corporate regulator now makes. She says ASIC has used its powers to investigate companies and individuals an astounding 18,625 times in the past three years. Companies need to make sure they have broad D&O cover to protect against these pres* sures. dustry,” he told Insurance News. “The real difference now is that we try to maintain a competitive advantage by the speed and quality of the customer experience. “It’s about making sure you have your whole supply chain backed up to support and manage it.” EBM Insurance Brokers’ General Manager Ward Dedman believes the continuing improvement of the claims process is being brought about by technology. 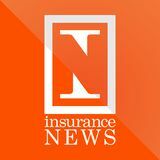 “Fundamentally the process has stayed the same but we are now more technology savvy, reporting claims electronically or over the phone,” he told Insurance News. “There are still some classes of claims that need the documentation, but now we can process a motor vehicle loss without the written correspondence.” Mr Dedman says the biggest advance by far has been the drop in excessive amounts of paperwork, which used to be a standard requirement for processing even the simplest claims. Brokers previously filled out mountains of forms for something as small as a windscreen repair. Now there has been a dramatic shift away from spending hours filling out forms, faxing or mailing them off and waiting for the reply. “Administration used to be a nightmare, but now some of that paperwork has fallen away with the use of websites,” Mr Dedman says. “does not recognise itself as a service industry with a responsibility to improve community awareness about its products and to deal with complaints promptly and fairly”. In 1991 ICA set up the General Insurance Claims Review Panel, an industry-supported but quasiindependent body with the power to adjudicate on disputed claims and impose a settlement on insurers. The service was free to consumers. During the same period the Government also introduced a compulsory code of practice for general insurance. In 1994, after extensive industry lobbying led by the formidable ICA Chief Executive Peter Daly, the Federal Government agreed not to move forward with the statutory code, agreeing instead to a “self-regulatory” code. But in 1997 allegations that some non-ICA insurers were not adhering to the code led to further tightening-up, with the code being made part of the Insurance Act 1973. Adherence to the code was made a condition of registration for general insurers. Today disputed claims are handled by the Insurance Ombudsman Service, part of the Melbourne-based Financial Services Ombudsman. CGU National Claims Manager Personal Lines James Merchant says the claims sector has seen a dramatic wave of consolidation in the past few years, technology has become far more important. Many of the larger insurers are dealing with an increasing level of claims and a wider geographic spread, and they’re coping by internalising services such as assessing, investigations and claims staff. “This has been a significant benefit, giving greater control and flexibility on how you react or resource your claims,” Mr Merchant told Insurance News. He believes the internalising of claims processes has led to better support of the company’s brand, because employees will invariably have a better knowledge of the corporate service issues and the policy than an outsider would. Mr Dedman agrees the claims process is now more userfriendly, but says insurers still have a long way to go. He sees the claims process moving even further away from paperwork to online claims forms, as well as the use of iPad “apps” and other tablet-enabled technologies. But he emphasises the need to use technology for efficiency gains – not to lower the level of human interaction. “Individuals are still going to be very vital,” Mr Dedman told Insurance News. “But in cases of major situations like the Queensland floods, the need for human involvement can slow down the process.” Mr Merchant says the move from paper-based processes to business-to-business capabilities is a vital step. “There has been a significant reduction from a staff perspective in double-handing, which also results in a significant saving to the customer in terms of response times.” He says the process will only continue to get better as the use of new technologies becomes more and more accepted. But Mr Pearson says technology is only as good as the people supporting it, and ultimately the key to moving forward lies in customer relationships. He says this means having a certain degree of “empathy” when dealing with people in their times of need. That’s something technology can’t do, and is the basis for Mr Pearson’s belief that an insurer is ultimately only as strong as its people. He says Suncorp has invested in recruitment and training to make sure customers have a “quality experience” when they put in a claim. He says this has included a shift towards recruiting people with “soft skills” – those who have good customer service credentials and empathy. Mr Pearson says the biggest test of the modern claims process is already upon the industry, thanks to the series of natural catastrophes which have engulfed eastern Australia in the past three months. CGU’s Mr Merchant agrees. “Most insurance companies have different ways of reacting and have flexible workforce arrangements in periods of bushfire and floods. “But the reality is we now have to become more proficient in managing these events.” But Mr McCracken says Suncorp – the dominant personal lines insurer in Queensland – views the Queensland floods as nothing more than “business as usual”. He says specialised customer response teams known as “storm-chasers” have been introduced to help cope with the extra workload following a catastrophe, because it’s “vital to have teams on the ground to respond in person” to customers’ concerns. “When you have a company of our scale and size it’s not unusual to have multiple events running at the one time,” he says. In March last year Suncorp doubled its personal lines claims from 60,000 to 120,000 with a number of significant events occurring simultaneously – the massive storms in Melbourne and Perth and flooding in New South Wales. “We delivered on all of that and I haven’t had one complaint,” he says. “We had a couple of issues but we can manage that with our dedicated event team.” Mr McCracken says there has also been significant relationship advances between claims departments and consumer groups. business interruption cover, 93% have public liability cover and 83% have fire insurance. These figures, compared with a startling 90% who believed they were adequately covered, reveal the scale of the underinsurance problem. “The low up-take rates of business interruption cover by SMEs is an issue,” Mr Pearson says. “And if a small business customer who is insured can’t recover because they don’t have enough business interruption cover, it doesn’t reflect well on our industry.” EBM Insurance Brokers General Manager Ward Dedman says exorbitant state taxes on insurance are a major deterrent to higher levels of insurance take-up. Apart from the contentious fire services levy in Victoria, New South Wales and Victoria, there’s also stamp duty imposed by all state governments and GST for the Federal Government. The Australian Bureau of Statistics says taxes on insurance in 2007/08 alone were $4.2 billion – compared with $2.1 billion in 2000. A Centre of International Economics report in 2005 said Australia was by far the most heavily taxed country when it came to insurance. Apart from the decision by Victoria last year to scrap the fire services levy next year – and balanced by a new State Emergency Service levy on premiums introduced by NSW in 2008 – little has changed. Except that property and asset values in Australian homes and businesses continue to increase. “Taxes in Victoria and NSW alike are almost as much as the premium,” Mr Dedman told Insurance News. CGU National Claims Manager Personal Lines James Merchant says in some ways technology could be one weapon in dealing with the underinsurance issue, with more and more insurers providing online calculation tools for home, building and contents. However, he admits there’s also a downside. While propertyowners can now more accurately calculate the replacement value of their homes, many people would find it financially difficult to increase their premiums. Trigger of cover In considering whether insurance cover has been triggered, a threshold issue in each case will be: “Is [flood] damage covered at all and, if so, on what terms?” Personal lines insurers often do not offer flood cover, but it is usually covered in industrial special risk policies insuring against property/material damage and BI. However, even where flood cover is provided, the use of different definitions for “flood” or “flooding” or “storm damage” means the scope of protection varies. The assessment of whether insurance cover has been triggered may be contentious and involve a combination of legal and factual issues. For example, it may not be clear whether temporary inundation per se constitutes “damage” – for example, where an access road is under water – or whether or not it must also cause damage to insured property for the policy to be triggered. by damage to a supplier’s property – perhaps a railway line – the supplier may have to be a direct supplier to the insured as distinct from an indirect supplier, further up the supply chain. Where an insured may seek to invoke a utility or services interruption extension, there may be a requirement for the supply to be interrupted as a result of an insured peril. In other words, an interruption by itself may not trigger the extension. business interruption. Its aim is to ensure that the amount indemnified is as true as possible to the actual amount lost by the insured as a result of the damage. For example, if the company affected is a major coal exporter and the damage incurred is so extensive it creates a price spike for coal globally, the insured could benefit once the business gets back on track. Whether this should be taken into account or not, and how this is included in the loss calculation, can create significant discussions and debate for the insured, insurer and reinsurer. As with the assessment of whether cover has been triggered, expert evidence or advice may be required to properly assess a number of these issues. Flood-affected businesses should keep comprehensive records relevant to the assessment of lost production/turnover/ sales and additional expenses incurred due to the flooding. They should notify their broker or insurer promptly of any potential claim or loss or damage which may give rise to a claim. clause in the reinsurance policy, they may insist on control of the claims, or otherwise seek to participate in the investigation, adjustment and settlement of losses. Key reinsurance issues might include: (a) triggers and aggregation and excess/attachment points; (b) reinstatements; (c) payments on account and how these should be managed, particularly where there is a reinsurance program with multiple layer and potentially non-aligned interests; and (d) where there is a captive or fronting arrangement, whether the insurance and reinsurance are truly back to back and the role the captive/front should play in claim investigation and negotiation. The timing of the events will also be important in allocating losses from the rainfall and flooding. In cases where insurance may have been renewed on January 1, the rain events could span different periods of insurance and reinsurance * cover. has applied the same approach in disputes about flood coverage under home and contents policies. Other issues that are likely to occupy FOS are the many different definitions of “flood” and sub-limits on cover. It will ask whether consumers understand the implications of the definition or the limitation – for example, the difference between “riverine” and other types of flood? There may be scope to argue that these are technical, ill-defined or not described with sufficient clarity. Alternatively, the construction of the policy may not be clear or incomplete information may have been given to the insured when they purchased the policy. If the policy was purchased through a call centre or via a website, it may be difficult for insurers to establish that they clearly informed the insured “in writing” before the policy was first issued. The Insurance Contracts Act doesn’t allow insurance notices to be given electronically, and some can’t be given orally. Remember, however, that if clear information was given in writing within 14 days, the insurer will have complied with the requirement. For policies sold on the phone, insurers will need to be able to produce accurate evidence of what was discussed during telephone calls. They may need to rely on other evidence (such as call centre scripts) to show that sufficient information about the flood exclusion was given when the insured purchased the policy. In short, if an insured did not properly understand they were not covered for flood, it would be worthwhile seeking advice from a broker or lawyer on whether the policy document was clear enough and whether any other information was given to the insured about the flood exclusion at the time they decided to purchase the insurance. Unfortunately for small businesses, there is * no such protection for them. Melbourne. “Training was the number one area in the survey which members wanted addressed. There is a lot of training in the market for insurers and brokers but not much for underwriting agencies.” “We addressed some of these issues at our inaugural training day by looking at cross-selling and time management, which are real drivers for the underwriting agency business.” UAC also aims to build more strategic relationships this year after Lloyd’s came aboard last year as a major supporter. “We’ve had approaches from several major insurers looking to invest resources in UAC,” Mr Coates says. “It could further enhance our service to the industry. He says as a not-for-profit organisation, UAC must build strategic relationships to help develop services for underwriting agents. He says the underwriting agency sector in Australia is more highly developed than in New Zealand or Asia, and UAC will continue to develop strategic relationships with organisations in the region. “The fact that underwriting agents in other countries are looking to adopt what we have done as an advanced model it just fantastic.” He says underwriting agents in Australia “realise there’s a need to continually raise the bar to remain relevant to the wider insurance community”. UAC’s membership is continuing to grow as the agency market flourishes. Last year it gained seven new members to bring its corporate membership to more than 70. Now the council is considering employing some full-time staff this year rather than relying solely on volunteers. “The underwriting sector needs to continue to grow to meet the needs and challenges of * clients,” Mr Coates says. MGA assistants discuss the next 10 years Adelaide-based national company MGA knows mixing business and pleasure is a recipe for success, so it provided a bit of something for everyone at its annual Broker Assistants conference at the seaside suburb of Glenelg. Apart from the heavy business – the event’s theme was “The Big 5 for the Next 10”, calling on the assistants to highlight the things they like would like to see improved in the next decade – there was plenty of entertainment, too. The two-day event’s leisure activities ranged from wine-tasting and a visit to the zoo to a relaxing cruise. Nearly 60 delegates from around the country attended the conference. Members of MGA’s operations team also attended. The following day saw delegates dress in pink in aid of the Jodi Lee Foundation, a local charity that raises cash for bowel cancer research. The day also included an inspirational talk by local mountaineer Katie Sarah, who reached the summit of Mt Everest last year. peopleNEWS eQuipped to lead the way QBE has toasted another group of emerging young talent at functions across the country as it brought its 2010 eQuip program to a close. The program aims to develop the capabilities of Australiaâ&#x20AC;&#x2122;s next generation of industry leaders, focusing on key business competencies for SME clients. More than 50 professionals attended each event in capital cities around Australia, with QBE regional managers from each centre hosting the function. The companyâ&#x20AC;&#x2122;s General Manager Australian Intermediaries, Shaun Stanfield, also facilitated a panel discussion at each event, which included one staff member, a program participant, a broker partner and a broker principal. The events had a double purpose: they celebrated the achievements of the 2010 eQuip participants while acting as an induction to those entering the 2011 program. Blue Eagle’s island adventures Brokers around Australia participating in the Allianz Blue Eagle program were given a mystery destination to fly to in December for their annual three-day year-end event. The event rewards and recognises key business partners, who were told to “dress for a range of activities”. Their destination was Hamilton Island, with sailing visits to Hayman and Daydream Islands. Over the three days guests enjoyed a variety of activities ranging from a formal black-tie dinner through to clay pigeon shooting. State pride was also on the line as teams competed against each other in beach olympics, beach volleyball and catamaran races. Chartis forum attracts top end of town Considering its pedigree as an insurer of major companies, global insurer Chartis can pull an impressive audience any time it likes – even when it’s early on a Sydney summer morning. The company’s Chief Executive for Australia, Noel Condon, and his Singapore-based predecessor Chris Townsend – now Chief Executive of Chartis Asia-Pacific – welcomed business leaders and insurance luminaries to a forum examining emerging risks. The forum at the Sofitel Sydney Wentworth was jointly organised with the UK Financial Times to raise awareness of the risks multinational corporations face today and in the future. Speakers included Westfield Group Chief Risk Officer Eamonn Cunningham, Financial Times Asia specialist Ben McLannahan and Lowy Institute for International Policy Director Mark Thirlwell. Chartis International Risk Management Director Bruce Abrams and Joe Garbutt, Director of Policy for the Institute of Internal Auditors Australia, also spoke at the forum. Pictured here, from left, Ben McLannahan, Mark Thirlwell, Noel Condon, David Lamb (Chartis) and Bruce Abrams. A big repair job If you want to be the best at repairing smashed trucks, you’ll need something to practise on. That’s the theory behind the presentation by National Transport Insurance (NTI) of a written-off truck for smash repair apprentices at SkillTech Australia’s new $13 million training centre in Queensland. NTI Chief Executive Tony Clark is pictured presenting the truck keys to SkillTech Australia Institute Director Mary Campbell and Automotive Business Manager Chris Kroehn. Mr Clark says truck repair expertise is an important issue to NTI, and the handover of the truck is just part of NTI’s long-term commitment to ensuring apprentices learn their trade on modern vehicles. Truck technology is changing rapidly, and Mr Kroehn says NTI’s donated truck will significantly benefit smash repair trainees because it features modern braking systems, an automatic transmission and engine technology.